WordPress Media Library Folders Pro Amazon S3 Launch! After several months of planning and coding today we are releasing the best way to connect your files to Amazon S3 all while using Media Library Folders Pro. 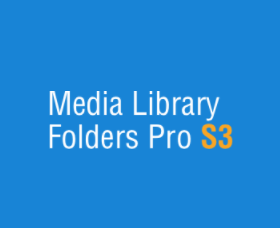 The Media Library Folders Pro S3 Addon requires a Media Library Folders Pro installation and license. It is a separate license and purchase. You can read more about how it works here and how to connect your S3 bucket to CDNs here. There is a video on the Basic Functions of MLFP S3 and the sequel More Basic Functions of MLFP S3.